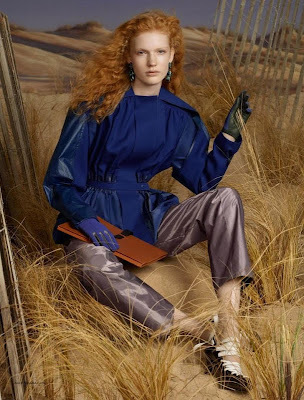 Dutch newcomer Anniek Kortleve initially captured the industry's attention with her fiery red mane during her Balenciaga worldwide exclusive appearance at the Fall/Winter 2012 collections. 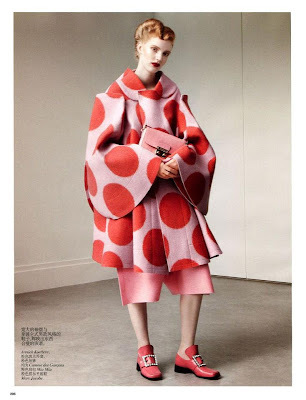 The nineteen year old statuesque 182 cm beauty who is represented by New York Model Management has since been photographed by Daniel Jackson for Vogue China and by model maker Steven Meisel for Vogue Italia, W Magazine and Balenciaga's Fall/Winter 2012 campaign. Kortleve struck a pose for Inoubliable Model Army during the pre-castings for Altuzarra and on the streets of New York as the Spring/Summer 2013 collections kicked off. Kortleve turned heads this season at Yigal Azrouel, Maison Martin Margiela and Moschino Cheap & Chic, signalling that red heads could well be the flavour of the month. Inoubliable Model Army sat down with Kortleve as the shows were winding down to discuss that Balenciaga exclusive, shooting with Steven Meisel, missing her rabbit Snuffles, and her plans for the future which include finding someone to make her a decent coffee. Inoubliable Model Army: How long have you been modelling for and how were you initially discovered? AK: I got scouted on the street when I was Christmas shopping with my mom when I was 14, but didn't start modelling full-time until last year because I had to finish school first. Inoubliable Model Army: Last season, you were a Balenciaga exclusive and shot the Balenciaga campaign with Steven Meisel. How were both experiences for you and what was it like going throughout the casting process for the show? AK: I went to the casting for Balenciaga a few months before the show and then they made me come in for fittings a few times. It was really easy and well organised. They were both great experiences. Singing along to the show music backstage and shooting the campaign on a fake beach in the studio. Why not? Inoubliable Model Army: The Spring/Summer 2013 season was your first full show season. Are there any highlights that stand out in your mind? AK: I loved doing the Maison Martin Margiela show because of all of the mysteriousness associated with the brand. They always seem to create this strange ambiance, which I think is really cool! Inoubliable Model Army: You're a relative newcomer. 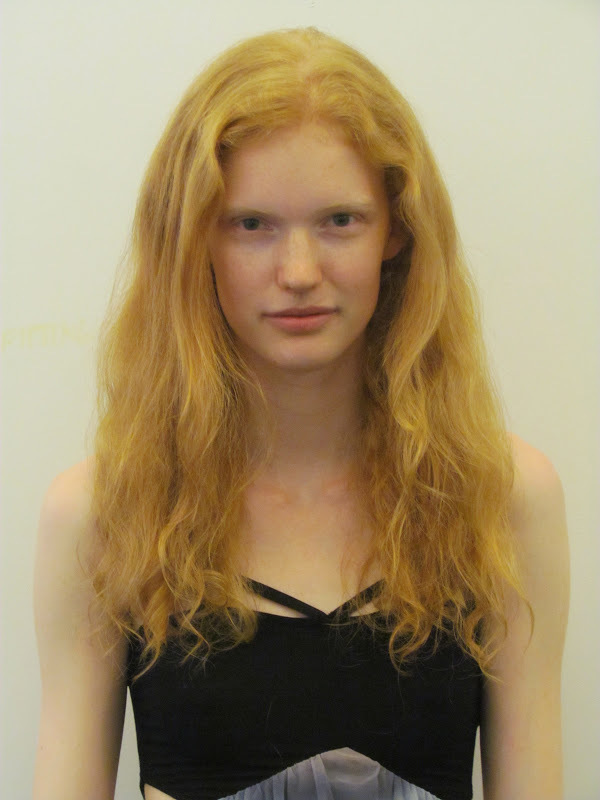 What was it like coming into the castings and shows as a new face? Did you bond with any other models in particular? AK: Josefien Rodermans and I went to the same high school so we've known each other since we were 12 years old and have been friends for quite a while now. It's nice to have someone close to you who's going through the same thing. Inoubliable Model Army: I love your hair colour! It reminds me of a model from the 80's called Kathryn Redding (google her)! Do you think having such a distinctive look/hair colour has helped you to stand out amidst the sea of newcomers? AK: Thank you! I love my hair colour too! It's always nice to be a little different so you can have a chat about it. It's a great conversation maker, like scars etc. 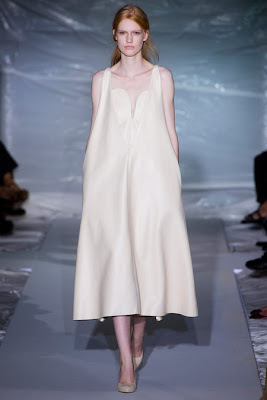 Inoubliable Model Army: What are your plans following the Spring/Summer 2013 show season? What are your hopes for the future and do you have any dream assignments in particular? AK: I just arrived back in New York so we'll have to wait and see what's going to happen here. In the future, I hope to find someone to make me coffee because I'm too impatient to make that myself and I'd like one day to write a column for a Dutch magazine or newspaper. Model-wise, I'd love to shoot an i-D cover one day! Inoubliable Model Army: What do you like and dislike most about modelling? Inoubliable Model Army: What has been the highlight of your modelling career so far? AK: Shooting with Steven Meisel for Balenciaga and Vogue Italia. Inoubliable Model Army: Do you think "exclusive" are good or bad for a model's career? AK: They're good otherwise they wouldn't exist!